Hayabusa was a Japanese spacecraft that brought back a sample of asteroid material to Earth in 2010, after a mission riddled with technical glitches. The spacecraft touched down on a small near-Earth asteroid called 25143 Itokawa and safely brought back minute rocky particles for analysis. The success of the mission inspired a successor spacecraft, called Hayabusa 2. This spacecraft is on its way to asteroid 162173 Ryugu and is expected to arrive in July 2018. Asteroid samples will be returned to Earth in December 2020. Plans for an asteroid-sampling mission actually predate the Japanese Aerospace Exploration Agency (JAXA), founded in 2003. A predecessor agency, called the Institute of Space and Astronautical Science (which today, is a part of JAXA) created a sample and return targeting mission that was planned for the 1990s, according to JAXA. The mission would have visited the asteroid 1943 Anteros. ISAS, however, ultimately decided not to proceed because its scientists concluded the technology was not ready yet. In the mid-1990s, ISAS developed a sample return mission called MUSES-C (or Mu Space Engineering Spacecraft). Its primary target was considered the asteroid 4660 Nereus, and its backup target was another asteroid called 1989 ML. Delays in MUSES-C's launch (due to a rocket failure) ultimately pushed both targets out of reach, so mission planners chose asteroid 25143 Itokawa as the target. MUSES-C launched on May 9, 2003, and was renamed Hayabusa ("falcon") shortly after its launch. A solar flare en route damaged its solar cells, which in turned affected the efficiency of the ion engine, according to Gizmodo. The spacecraft performed a flyby of Earth on May 19, 2004, to gain speed for its long voyage. The spacecraft then arrived at 25143 Itokawa on Sept. 12 (three months later than planned, due to its ion engine troubles) and sent back high-resolution images of the asteroid back to Earth. The shadow of Hayabusa, along with a target marker (circled, at left), is shown on asteroid Itokawa in November 2005. In early November, JAXA announced that Hayabusa would do a practice descent on Nov. 4, but the attempt was later aborted because of difficulties finding a landing site. Then the spacecraft attempted to send a small probe called MINERVA to the surface on Nov. 12. MINERVA, an acronym for MIcro/Nano Experimental Robot Vehicle for Asteroid, was a 1.3-lb. (half a kilogram) test lander that was supposed to hop from location to location, taking pictures of the surface. The little lander, however, drifted away from the Hayabusa spacecraft into space — never reaching its intended target. Hayabusa also attempted to fire a probe at the surface and gather the dust it produced, but that experiment also failed. 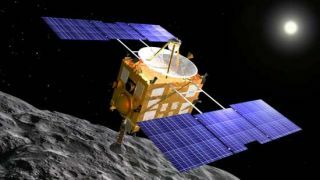 Ultimately, Hayabusa touched down on the asteroid surface twice in late November, but on both occasions it went into safe mode and it was unclear whether it gathered any material while it was on the surface. "Problems with frozen pipes, leaking fuel, and communications glitches caused even more consternation as the spacecraft attempted to depart the asteroid," Gizmodo added. "By the time the return capsule was headed back to Earth, only two of four ion engines and seven of 11 batteries were working; another ion engine automatically shut down partway through the journey home. By re-entry, the reaction control system was no longer functional." Re-entry back to Earth also wasn't smooth, to say the least; Hayabusa broke up when it entered Earth's atmosphere on June 13, 2010. Luckily for investigators, dust was collected at the asteroid and it did survive the perilous re-entry; the sample return capsule was picked up from Australia and flown to Japan for investigation. In November 2010, JAXA said it had collected 1,500 grains that "were identified as rocky particles"; most of them were thought to come from "extraterrestrial origin" (meaning, the asteroid). JAXA had known beforehand that the particles of material were there, but it took several months of analysis to confirm they were not contamination from Earth or from Hayabusa's voyage. In the initial results, JAXA announced it found minerals such as olivine and pyroxene, which are common on Earth and have been found on the moon and Mars. The particles were tiny, just one-tenth the width of a human hair (10 micrometers in size). Several articles on Hayabusa's dust collection appeared in the Aug. 26, 2011, issue of Science; among the findings was confirmation that the dust on 25143 Itokawa was identical to material on an LL chondrite type of meteorite. This finding confirmed showed link between meteorites and asteroids. One of the more interesting findings has to do with submicrometer craters on the surface of the particles. Some of the earlier results showed one to two craters on individual particles, while a September 2016 update reported one particle had 15 individual craters. This particle's craters were "formed by fragments produced by the impact process of a tiny celestial body on the surface of asteroid Itokawa," JAXA reported.